India, a Union of States, is a Sovereign Democratic Republic, governed by a Constitution, which came into force on the 26th of January 1950. The Constitution, federal in structure with unitary features, defines the power exercised by the States and the Union. The President of India is the constitutional head of the executive of the Union. He acts according to the advice of the Council of Ministers with the Prime Minister at the head-the real custodian of the executive power- who is responsible to the Parliament consisting of two houses, the Lok sabha and the Rajya Sabha. Parliament and the Supreme court provide a medium of checks and balances on the powers of this executive authority. The Prime Minister and his Cabinet can be removed by a vote of no confidence passed by the House. The major industry of Delhi is Politics! A session at the Sansad Bhavan is a good valued entertainment and permission for this can be had from the Embassies of various countries located in Delhi or through the High Commission or by means of an MP. Debates and cross-banter are in English and the Indian constitution is loosely based on the West Minister model of the British. 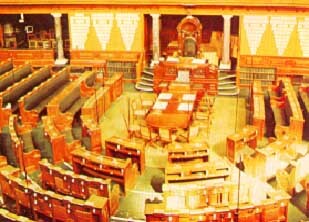 The Lok sabha has 544 elected members; it sits for eight months in the year and elects its own Speaker. The ruling party draws its Prime Minister and Cabinet from this house. Like the American Senate, membership of Rajya Sabha is by election, except for a dozen appointments by the President and a third of the 245 members retire every two years. It lacks a speaker but has the Vice President as the Chairman. Parliament legislates, amends the Constitution, elects the President and Vice President and must approve a Proclamation of Emergency. An MLA has as many votes as the number in thousands obtained when the population of his state is divided by the elected membership of his legislature. An MP has as many votes as the number obtained by dividing the total votes assigned to the MLAs by the elected membership of the two houses of Parliament. The elected members of the two houses of Parliament and of the State Legislative assemblies constitute the Electoral College for the President. Any citizen of India above 35 years, owes allegiance to the constitution and swears by the sovereignty and integrity of India, can contest for the post of President. A President can hold office for 5 years and can seek re-election for any number of subsequent terms. A President can be removed by Parliament only through impeachment for violation of the constitution. The President's residence is called the Rashtrapathi Bhavan. The Vice-President, elected by the members of the Parliament discharges the function as Chairman of the Rajya Sabha. He also acts as the President during the absence of the President. The executive power of the Central government is normally vested in the President, who is also the Supreme commander of the three armed forces.